Exmouth is a town on the tip of the North West Cape in Western Australia. Keep things going the next day: see the vivid underwater world at Ningaloo Reef, then enjoy the sand and surf at Turquoise Bay, and then take in the exciting artwork at The Ningaloo Gallery. To find traveler tips, ratings, where to stay, and tourist information, you can read our Exmouth trip planning website . Sydney to Exmouth is an approximately 12-hour flight. You can also do a combination of flight and car; or drive. Due to the time zone difference, you'll gain 2 hours traveling from Sydney to Exmouth. Traveling from Sydney in October, expect nights in Exmouth to be about the same, around 19°C, while days are somewhat warmer, around 39°C. Finish your sightseeing early on the 18th (Mon) so you can drive to Coral Bay. Coral Bay is a small town on the coast of Western Australia, north of Perth. Start off your visit on the 19th (Tue): get interesting insight from Tours. Here are some ideas for day two: head outdoors with Aqua Rush, then identify plant and animal life at Ningaloo Marine Park, and then see some colorful creatures with a scuba or snorkeling tour. To find where to stay, ratings, reviews, and tourist information, read our Coral Bay online trip itinerary builder . You can drive from Exmouth to Coral Bay in 2 hours. Alternatively, you can take a bus. Wrap up your sightseeing on the 20th (Wed) early enough to drive to Kalbarri. Kalbarri is known for nature, zoos & aquariums, wildlife, adventure, and beaches. Your plan includes some of its best attractions: learn about wildlife with up-close encounters at Rainbow Jungle, get the adrenaline pumping with an extreme tour, contemplate the waterfront views at Hutt Lagoon, and take in the dramatic natural features at Nature’s Window. To find photos, more things to do, ratings, and more tourist information, read our Kalbarri trip planner . Getting from Coral Bay to Kalbarri by car takes about 7 hours. Other options: take a bus; or do a combination of bus and flight. Finish up your sightseeing early on the 24th (Sun) so you can travel to Jurien Bay. Jurien Bay, is a coastal town in the Wheatbelt region of Western Australia, 220km north of Perth facing the Indian Ocean.HistoryThe coastline around Jurien Bay was first known to Europeans in the 17th century. Kick off your visit on the 25th (Mon): make a trip to Jurien Bay Jetty, cast your line with a fishing tour, and then identify plant and animal life at Sandy Cape Recreation Park. For traveler tips, maps, ratings, and tourist information, read our Jurien Bay driving holiday planner. Drive from Kalbarri to Jurien Bay in 4 hours. Cap off your sightseeing on the 25th (Mon) early enough to go by car to Cervantes. Cervantes is a town in Western Australia off Indian Ocean Drive about 198km north-north-west of the state capital, Perth in the Shire of Dandaragan local government area. Start off your visit on the 26th (Tue): contemplate the waterfront views at Lake Thetis, then enjoy the sand and surf at Hangover Bay, and then take in the dramatic natural features at The Pinnacles Desert. 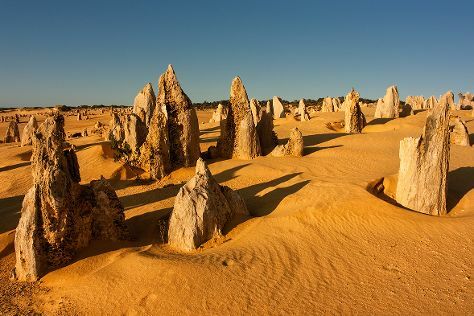 On your second day here, explore the wealth of natural beauty at Nambung National Park. For where to stay, traveler tips, reviews, and other tourist information, read our Cervantes attractions planner. Cervantes is just a short distance from Jurien Bay. Finish up your sightseeing early on the 27th (Wed) so you can go by car to Lancelin. Lancelin is a small fishing and tourist town 127 km north of Perth, Western Australia. Start off your visit on the 28th (Thu): head outdoors with Lancelin Adventures, step off the mainland to explore Lancelin Island, and then tour the pleasant surroundings at Back Beach. Getting from Cervantes to Lancelin by car takes about an hour. In October in Lancelin, expect temperatures between 29°C during the day and 11°C at night. Finish up your sightseeing early on the 28th (Thu) so you can travel to Armadale. Armadale is a suburb of Perth within the City of Armadale, located on the south-eastern edge of Perth's metropolitan area. Start off your visit on the 29th (Fri): take an in-depth tour of Armadale History House, then view the masterpieces at Emma Blyth Gallery, then see majestic marine mammals with a dolphin and whale watching tour, and finally take a leisurely stroll along Dolphin Quay. Inspirock's itinerary builder makes planning a Armadale trip simple and quick. You can drive from Lancelin to Armadale in 2 hours. In October, daytime highs in Armadale are 28°C, while nighttime lows are 12°C. Wrap up your sightseeing by early afternoon on the 30th (Sat) to allow time for travel back home.